Despite the fact my fridge's average contents include Sprite Zero, leftover pizza and yoghurt that may or may not have started as milk, there are those for whom the idea of a fridge/freezer that is bigger on the inside than it is on the out is a dream come true. 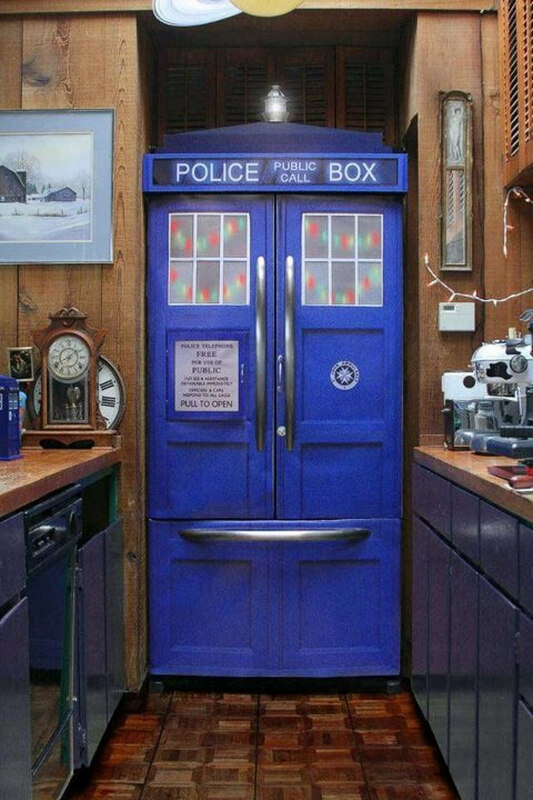 Well that dream will still have to wait, but second best for Whovians, is this Tardis themed former 'whiteware', that replicates Dr Who's iconic means of time and space travel, even if it doesn't offer the main selling benefit to your fruits and veges. Behold! That might just even puzzle the kids for a few days 'Mum, can't we just get a cordless phone like every other family?' Think of the savings from non-random food grabbery! Okay so your best mate might pretend to leave, jump inside and scream 'The Cybermen are coming! The Cybermen are coming!' But hey, every kitchen has at least one egg right? Well, except mine. This is even cooler than the Dalek Christmas Tree my dad found earlier this week! I want this for Christmas. More than anything else I have ever wanted for Christmas. I want this. Except maybe Robert Plant. This might be a tad more realistic though. So yeah. I want this. Any notes on if it really is bigger on the inside? Cause if it is, it really is the dream come true of refrigerators. Mine just never has enough space for all the leftovers and my...*ahem*...adult beverages. Oh come on. You know the Doctor had an entire room on that beast dedicated to every spirit known, or unknown, to man. Asking for fridge space isn't too much!